This roller assembly supports your boat's keel for easy loading and safe transport on your trailer. It features a 4-inch, black rubber spool roller and a galvanized steel bracket that attaches to your trailer's tongue. 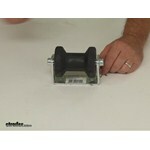 Call 800-298-8924 to order CE Smith boat trailer parts part number CE32100G or order online at etrailer.com. Free expert support on all CE Smith products. 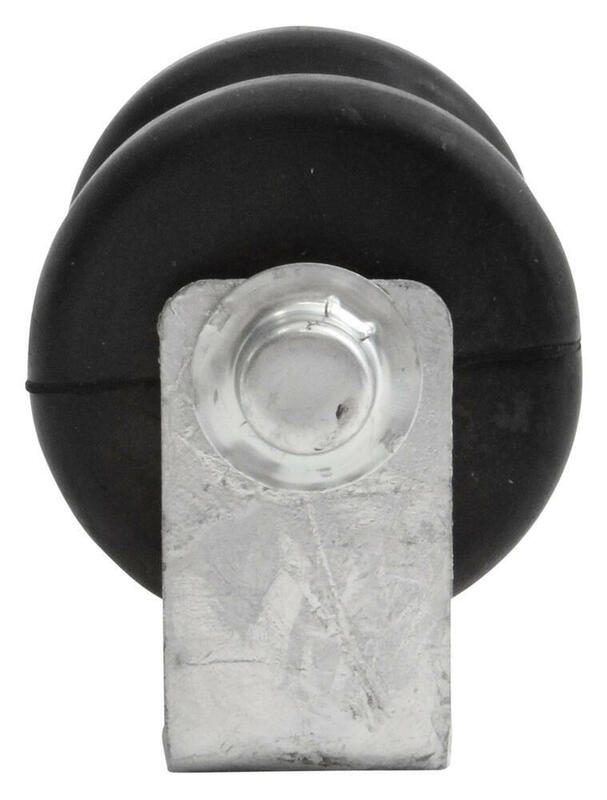 Guaranteed Lowest Price and Fastest Shipping for CE Smith Spool Roller Assembly for Boat Trailers - Galvanized Steel and Black Rubber - 4". Boat Trailer Parts reviews from real customers. Video of CE Smith Spool Roller Assembly for Boat Trailers - Galvanized Steel and Black Rubber - 4"
Today were going to review part number CE32100G. This is the CE Smith spool roller assembly for boat trailers. This roller assembly will support your boats keel for easy loading and safe transporting on your trailer. It features a four inch wide black rubber spool roller and a galvanized steel bracket that attaches to your trailers tongue. This part is typically installed flat on the tongue of the boat trailer and the spool roller bracket assembly will stabilize the keel of the boat during trailering. 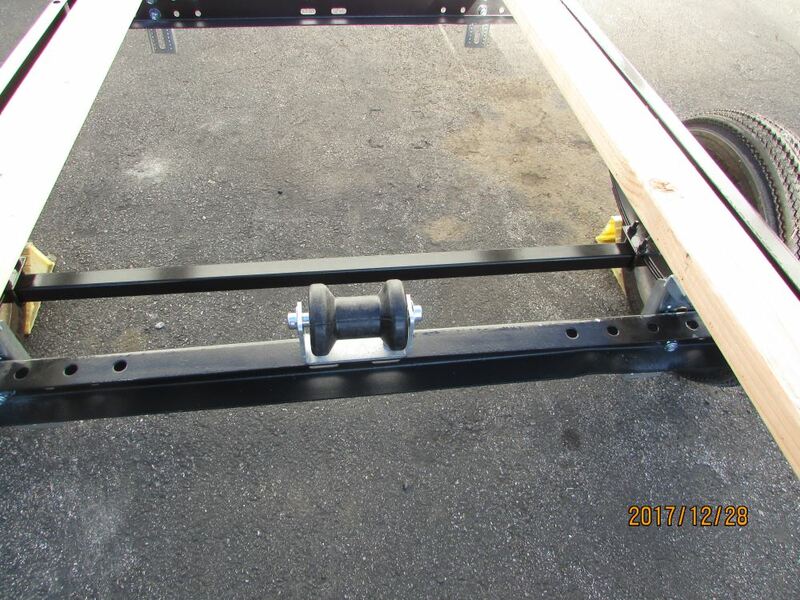 The spool roller itself will support your boats keel as it sits on the trailer, prevents the bow of the boat from making contact with your wench, eases the loading and unloading of the boat, and it also helps absorb road shock while the boats being trailered. The galvanized bracket will let you bolt your roller assembly onto the tongue or frame of your boat trailer. It does require seven sixteenths of an inch fasteners which are not included. This bracket is made of sturdy one eighths inch galvanized steel which will resist corrosion. The actual galvanized steel parts are hot dipped in a zinc plating after they are stamped. This will create a coating that is typically three millimeters to five millimeters thick. The thick all-around coating allows the galvanized steel pieces to provide years of use without rusting or corroding. Has a black rubber roller which will deliver long lasting performance. A few dimensions on this the roller length itself is four inches. The shaft that the roller spins on is five eighths of an inch in diameter. The mounting holes on the bottom will measure seven sixteenths of an inch in diameter. The spacing from the center of one hole to the center of the other is three inches. Just to give measurement overall on this bracket is four and a half inches long and about one and a half inches wide. This part is made in the USA. That should do it for review on part number CE32100G. Order: RelevanceNewestRating - High to LowRating - Low to High This roller assembly supports your boat's keel for easy loading and safe transport on your trailer. It features a 4-inch, black rubber spool roller and a galvanized steel bracket that attaches to your trailer's tongue. Overall height is about 3-3/4 inches, overall width is about 5-3/8 inches. That being said, I am not sure this is the right part to help you out with loading. A keel roller, typically mounted at the rear of the trailer, will help guide the boat toward the center of the trailer and help it line up square between the bunks. $6.89. The TPE roller will not mark up your boat. This product works very well, still in good shape and was easy to install. I went to our warehouse and measured the CE Smith Spool Roller Assembly for Boat Trailers # CE32100G. It measures 2-1/4-inches from the bottom of its mounting plate up to the center of the rubber roller. Overall width is 5-inches and overall height is 3-3/4-inches. All of these dimensions are noted on the photo I prepared for you. Transom savers install by having one end attach to the lower section of your outboard motor and the other end goes to some point on the trailer. Typically a roller. The CE Smith Spool Roller Assembly part # CE32100G would work well for this. It is indeed possible to purchase the roller minus the bracket. Yates offers a Spool Roller that's 8 inches long that's designed for a 5/8 inch shaft, part # YR8302-5. If you needed the panel bracket, it's part # CE10303G and part # CE10725A for the 5/8 inch shaft and pal nuts. Is The Roller On The CE Smith Spool Roller Assembly Removable? 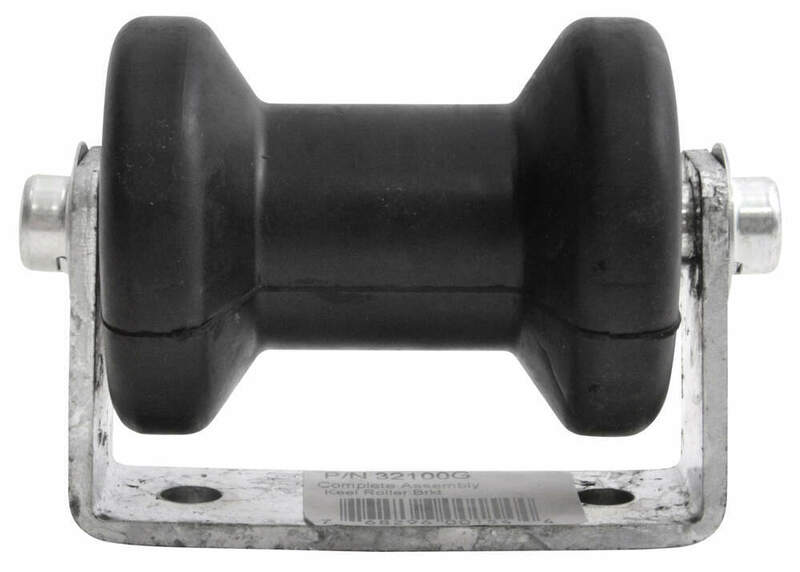 The CE Smith Spool Roller Assembly for Boat Trailers - Galvanized Steel and Black Rubber - 4" # CE32100G has a keel roller that can be removed. If removed, you will require a Replacement Cap Nut - Zinc - 1/2" - Qty. 1 # CE10800 to reinstall. The closest thing that we carry to the roller assembly # CE32100G at this time is the Panel Bracket # CE10300G. This does not include the shaft or the end caps, so you will need the Roller Shaft with Pal Nuts # CE10721A as well.